Yoga poses work both at cellular and molecular levels to boost immunity system of our body. NF-kB system is the master regulator of our immunity. 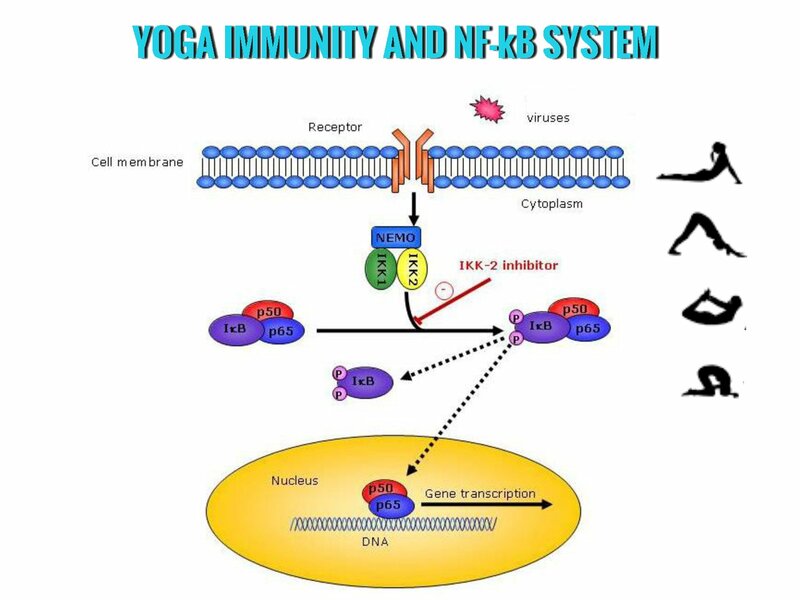 Yoga exercise inhibit NF-κB signaling at various control points to enhance immune system. Thymus gland is responsible for building strong immune system. Proper yoga exercises strengthen and stimulates the thymus activities. Dynamic yoga poses are the best way to improve immunity. Exactly how yoga poses and breathing exercises inhibit NF-KB activities and improve immunity is under scientific investigation. 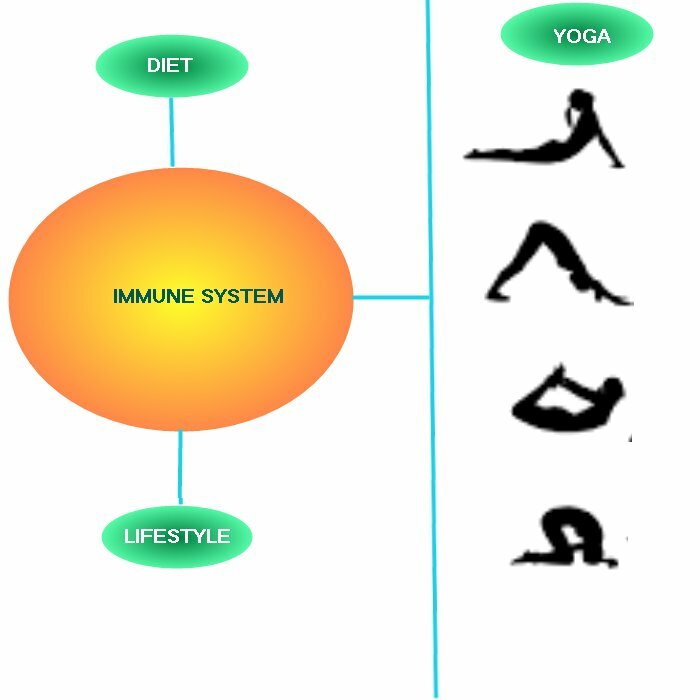 In this review we will focus on the yoga poses that have direct impact on immunobiology. Yoga is an ancient form of exercise that includes stretching, twisting, bending and breathing exercises to boost physical and mental wellbeing. Yoga practice can help our cells to fight against harmful microorganisms and viruses by boosting our immune system, reducing stress and strengthening our body functions and systems. Physical and mental stress increases the release of cortisol and adrenaline and decreases immune system’s ability to fight infection. However, moderate levels of yoga practices reduces the stress hormones and increases the immune system’s ability to fight against infections like cold and flu. Regular yoga practice improves cardiovascular health, lowers blood pressure, helps control body weight, and protects against a variety of diseases. Yoga contribute more directly by promoting good blood circulation, which allows the cells and substances of the immune system to move through the body freely and do their job efficiently. There are many different styles of yoga, such as Ashtanga, Iyengar, Sivananda and Dr. Amit Ray’s Integrated Yoga and Vipassana meditation. Different yoga techniques require different yoga postures, breathing exercises and cognitive processes and thus produce different effects on immunity and brain structure. But, despite differences in yoga techniques and underlying processes, it has been observed that all yoga techniques share some primary process that supports their common goal, that is, inducing relaxation, tonifying the internal organs, strengthening the connective tissue, detoxifying the body, correcting misalignment of the spine, developing good breathing habit, stilling and purifying the mind. Scientists are trying to understand the underlying mechanism of yoga practices to boost the immunity system of the body. To do this sort of research, yoga scientists typically ask yogis to practice yoga exercises; the scientists test their blood and urine before and after the exercise to detect any changes in immune system components such as hormones, cytokines, white blood cells, and certain antibodies. The changes have been recorded, immunologists interpret these changes in terms of human immune response. Regional NF-kB activity in the nervous system are monitored longitudinally and non-invasively via in vivo luminescence imaging. Researchers are using various updated biomedical technologies, neuroimaging techniques and other tools to analyze patterns in order to better understand how the many pathways involved in yoga practices to boost immune system. Yoga poses that includes the movements of neck, chest and the whole body are best for enhancing the immune system. It is observed that yoga poses improve immune system through lymph drainage. We have observed, dynamic yoga poses (yoga poses with movements) are the best way to improve immunity. The body’s defense system is comprised of two domains: innate immunity and adaptive (or acquired) immunity. These two aspects interact together to provide an integrated immune system. Chronic inflammation is considered as the major factor in the development of degenerative disease and loss of youthful functions. The NF-kB system plays a crucial role in immune and inflammatory responses through the regulation of genes. In recent years, a massive volume of scientific studies support the role of nuclear factor kappa binding (NF-kB) for chronic inflammation. Too much NF-kB response contribute to states of chronic inflammation such as arthritis, asthma, multiple sclerosis, and colitis. The master regulator of the innate immunity is the NF-kB system. During aging, adaptive immunity significantly declines. Immunity can be improved by blocking of NF-κB signaling at various control points. Moderate level yoga exercises help to block the activities of the NF-κB signaling. Most of the decline in immune system function is a direct result of degradation of the thymus gland. The shrinking of the thymus gland with age, resulting in changes in the architecture of the thymus and a decrease in tissue mass. Thymus gland is the master of the hormones and the immunity booster. The Greek word thymos means “life energy!” The thymus gland is situated in front of the heart and behind the sternum bone of the chest. T-cells are the primary products of the thymus gland. They are called T cells because they mature in the thymus. When the number of T cells in the body drops below a certain level, the person gets sick because the immune system doesn’t have enough T cells to fight off infection. Yoga stimulates the thymus gland which builds immunity and massages the lungs, heart, bronchial tubes. Here are five user-friendly yoga poses to increase your immunity. If you are a beginner, you need to follow certain basic rules of yoga. Hold each position for 5 to 10 breaths. Seated poses can be held for longer, as long as you feel comfortable. Keep your breath smooth and even throughout the poses. 1. Downward Facing Dog (Adho mukha svanasana): Encourages full-body blood circulation. This asana stretches the shoulders, legs, spine and whole body; builds strength throughout the body, particularly the arms, legs, and feet; relieves fatigue and rejuvenates the body; improves the immune system. The body forming an inverted V-shape. 2. Fish pose (Matsyasana): This pose improves your respiratory systems and nurtures the thymus gland. By lifting your chest, tucking your arms underneath your body and bending the neck backward, you will improve postural defects such as rounded shoulders and the cervical region of your spine, thus releasing pressure on your nerves. 3. Cobra pose ( Bhujangasana) : This pose stimulates the thymus gland. Cobra pose strengthen the spine, stretch the chest, shoulders, and abdomen, firm the buttocks, and relieve stress and fatigue. 4. Bow pose ( Dhanurasana ): This pose strengthen your abdominal organs. This pose stimulates the thymus gland by opening up the chest. Tis pose adds greater flexibility to the back and a good stress and fatigue buster. 5. Bridge pose ( Setu bhanda) : This pose stimulates the thymus gland and improves blood circulation. The bridge pose curl up your body and feel your tired back relax instantly. It stimulates the endocrine and nervous systems. To boost our immune system, we need a balanced lifestyle with proper diet, exercise, vitamin C, ProBiotics and relaxation. Scientists observed that laughter naturally strengthens the immune system, helps lift depression, as does being around pets! Hence, along with yoga exercises and yoga breathing we need a balance lifestyle to boost the immunity functions of our body. This entry was posted in Articles, Immunity Research, Yoga, Yoga for Stress Relief, Yoga Life Style, Yoga Postures, Yoga Research and tagged balance lifestyle, Immune System, immunity, nf-kb inhibitor, T cells and yoga, Thymus gland, yoga and thymus gland, yoga NF-kB, Yoga Poses to Boost Immune System. Bookmark the permalink.